Glastonbury differs from "arena" style festivals like Reading and V in that, with the exception of the car parks, the campervan fields, some crew camping, Worthy View and the specialist glamping campsites, the whole festival is entirely within the main fence. Once you enter through the gates, you don't have to leave again until the Monday afternoon and you can pretty much wander freely wherever you want other than the backstage, traders' and crew areas. You are able to camp in any of the designated public camping areas provided they have not already reached their allotted capacity when you get there. This is far and away the most Frequently Asked Question of all so please excuse me if I dwell on the subject for a little while. I suggest that anybody who doesn't get excited about looking at lots and lots of photos of tents in fields might like to move right along to the next section at this point because every year since I first started this project in 2004 I have made an annual tour around the site taking pictures in the various camping fields so that I can actually show you what they are like as well as giving you a little description of a few of the pros and cons of each one. When people find a campsite they like they tend to return to the same spot year after year. In fact a survey of festival goers a few years ago showed that no less than 60% had returned to the same place they were the previous year so it's well worth giving this subject some serious consideration in advance rather than leaving things to chance when you get there. There is no right or wrong answer to this question as everybody has different ideas as to what makes a perfect campsite. Some want a good night’s sleep and I would therefore advise heading towards the more remote areas in the northern and western extremities of the site, which will be comparatively quieter. Others want to be close to their favourite stage or entertainment area and more still want to be in night time Party Central. Your choice may be restricted by which pedestrian gate you enter the site through and how far you are prepared to walk to your campsite once you get in. Later arrivals will also find that there will be a considerably reduced choice of fields which still have camping space available. Take a look at the 2017 Site Map for reference and we'll work our way anti-clockwise around the site starting in the top right hand corner. To give you a rough idea of how quickly the various fields fill up all of these photos were taken sometime between 10am and 1pm on the Thursday in either 2016 or 2017. There is an area known as Cockmill Meadow in the north eastern corner of the site which is specifically reserved for Family Camping. There is no designated ratio of adults to children in any group so families and friends without children are able to camp together here but please bear in mind that this area is popular and space is limited so people without kids in tow should look elsewhere. In fact the area available for public camping in this field was reduced considerably in 2011 due to the expansion of the recycling area at the top of the hill. Also note that the field is traversed by a set of power lines which can hum and crackle quite alarmingly when it is wet. Cockmill Meadow is entered almost immediately from Gate B but this is quite difficult to access for the majority of ticket holders unless you manage to get yourself into the Eastern "Purple" car parks, so alternatively use the "Blue" Car Parks and enter the site at Gate C, turning right up the track which runs uphill between the Acoustic Tent and the Kidz Field (you can clearly see the big helter-skelter in the Kidz Field in the photo above). It's a long hike from the Western Gates A and D so people entering via those gates with their kids may find it more convenient to choose the alternative Family Camping area in Wicket Ground. Later arrivals will also find that Wicket Ground will still have masses of space available long after Cockmill Meadow is full. This photo is taken from the often appropriately named Muddy Lane, which runs up the Eastern side of Big Ground and is looking directly down the hill towards the Pyramid Stage. This and the adjacent fields afford the best access to the main stage as well as some pretty spectacular views across the southern part of the site. Big Ground and the other fields on the hill which overlooks the Pyramid tend to fill up fairly rapidly on the Wednesday as they are popular with those who like to be close to the action on the main stage. Again Gates B and C to the East of the site offer the quickest and easiest access to this area. Here we are looking downhill over the flatter area of Kidney Mead, which is also handy for the Pyramid Stage as well as the Acoustic Stage, the Cider Bus, William's Green and the main central market areas. However it is also close to some of the busiest toilets on the site so make sure that you camp well clear of these to avoid noise & nasty niffs. Try to access the site via Gate C if you are planning to camp here. Row Mead looks out directly over the Pyramid Field and it is therefore very popular with those who like to watch and listen to the acts on the main stage from the comfort of their own encampments. The area available for camping here was reduced quite significantly in 2013. I assumed at the time that this was purely to cater for the enormous crowd who were anticipated to watch the Rolling Stones' headline set on the Saturday night that year, but it appears to be a permanent change as the same area has been roped off again in the subsequent years. This is Hawkwell, which sits on the slope immediately below Worthy Farm. As you can see it’s on a very steep incline and some of those tents near the top of the hill must be pitched at something approaching a 45 degree angle which can’t possibly be conducive to a comfortable night’s sleep. Moving further westward and looking downhill toward the Pyramid Stage, this is Michael's Mead. Like the adjacent Hawkwell, Michael's Mead can be quite steep in places. This area is fairly central and so is just as accessible from the Festival Bus Station at Gate A as it is from the Eastern Gates B & C.
Webb's Ash is flatter and as you can see it is very close to the action on the Pyramid Stage. The distinctive yellow and green marquee to the left of the picture is the Mandela Bar so you never have far to walk for a beer either. Lulu’s Café, which is over by the woods to the western side of Webb's Ash, is also a very popular breakfast haunt. This is Spring Ground, which is home to the Disabled Camping Area, and has a concrete ramp at the entrance to the field in order to make wheelchair access easier as well as charging facilities for mobility scooters, a high dependency unit and all sorts of other ways of making life a little more comfortable for those with disabilities. The Disabled Camping area is reserved for people with permanent disabilities and their carers. Campervans are also allowed in this field for disabled visitors. Make sure you register well in advance in order to be able to camp here. There’s more details on facilities for the disabled together with some useful links for first hand experiences later on in Part 4. The fields at the extreme Northwestern end of the site between the farm and Gate A tend to fill up less quickly than the other fields to the north and there is often space available here for later arrivals. You'll have a great view looking south across the site but you will probably find yourself camped on quite a slope. The photo above is of Hitchin Hill looking out across the site with the Pyramid Stage just above and to the left of the centre of the shot. Next to Hitchin Hill and at the most northerly point of the site is Lime Kiln Ground. Again you will be waking up to spectacular vistas if you choose to pitch your tent here including views of Glastonbury Tor, which you can just about make out at the top of the picture above. It is a long uphill slog back to your tent each night however and this area certainly isn't for night owls who enjoy the after hours attractions of the South East corner as it's as far away from that part of the site as it's possible to get. On the other hand you may see this as being an advantage. Here we are looking down over the second Family Camping area of Wicket Ground and as you can see there is tons more space here than there is in the traditional family camping field of Cockmill Meadow. The field also has the advantage of fencing to prevent youngsters from escaping and stewards at the entrance ensure that this area is reserved entirely for families with younger children. To access this area use the Western car parks and enter the site via Gate A if at all possible. As you can see Lower Mead is very handy for those who enjoy watching the up and coming talent at the John Peel Tent. It is only a relatively short walk from Pedestrian Gate A and you'll find that the Pyramid, the Other Stage and the Silver Hayes dance area are all very accessible from here. You will find that this area suffers from 24 hour traffic noise as the main access road for the site runs behind a fence along the bottom of the field. However, this area doesn't get as congested with foot traffic as it did prior to the John Peel Tent moving to its new position in 2016. In 2010 the fenceline was extended considerably in the West to provide lots of additional camping space in this portion of the site. The first field you come into if you enter via Gate A nowadays is called Darble and it is therefore perfect for those who arrive by public transport and want to get their tents up as soon as they get on site. It also includes the designated area specifically reserved for people who cycle to the festival. The next field heading south from Gate A is rather unimaginatively known as Pylon Ground, and it’s pretty obvious from the photo above how it got its name. During the period of time that I have been attending the festival the site has been extended several times to include new camping areas and whenever this happens it takes a little while for people to see their benefits and move away from their old favourites. As you can see from the amount of grass visible in this photo there was still tons of space available here on the Thursday lunchtime in 2017 even though it's still a relatively short walk from Gate A and very close to both the John Peel Stage and the Silver Hayes dance area. Further down the hill again we have the rather more attractively named Rivermead. Again plenty of space here for later arrivals and also lovely and flat for comfortable camping but in a wet year I would suggest that its proximity to the river would make it rather soggy underfoot. Incidentally the caravan in the photo above doesn't belong to a member of the public. It's one of the campsite steward bases which are to be found in all but the very smallest camping fields. Another large field made available for the first time in 2010 was Bushy Ground and again there was plenty of camping space here even though a large proportion of the field was cordoned off that year in order to provide enough room for 40,000 people to watch England’s World Cup match against Germany. The whole field has been made available for public camping in subsequent years. One thing you do have to remember if you camp here is that the Steanbow dairy unit lies between Bushy Ground and the remainder of the festival site and as the dairy is out of bounds to festival goers you will have to navigate your way around it in order to find your way to and from your tent each day, which can be a bit of a faff. Bushy Ground is easily accessible from either of the Western Pedestrian Gates A or D.
The majority of the flat camping areas within the site can be found in the section bordered by the Silver Hayes dance area to the north and the disused railway track to the south. Personally I’ve never camped in this part of the site because these fields are among the most low-lying areas and are therefore the most likely to get muddy if it's wet. The north western half of this field used to be known simply as "Dance Field" and you can see why with the flags and marquees of Silver Hayes in the background. Nowadays the entire area is known as Oxlyers and it's also the closest camping area to The Other Stage, which you can clearly see beyond the tents in this photo. In addition it’s a relatively short walk from here to the Pyramid Stage and the Park is also less than 10 minutes away so many people consider it to be a prime central location for easy access to most of the main entertainment areas. The quickest way to find your way to this area when arriving is via Gate A, from which it is then a relatively easy downhill walk through Silver Hayes. Here we have Dairy Ground which is actually the field which I often used to park my car in before the site was extended to bring this field inside the fence for the first time in 2007. It is immediately accessible from Gate D so it’s the most convenient place to stop for those arriving by car and parking in the majority of the Western Car Parks. The bottom of this field used to be prone to flooding but the affected area is largely cordoned off for use as crew camping and the public area nowadays only represents a relatively thin strip of the field running along the western fenceline. I was actually very surprised at how much space was still available when I last made my Thursday lunchtime meanderings through this field in 2017. Most of the people who were arriving at that time seemed to be herding straight through here in search of non-existent spaces in the more popular fields to the south of the site, most of which had already been choc-a-bloc full since the Wednesday. Please note that on every site map which was produced between 2007 and 2015 this field was known as Paines Ground and vice versa with Paines Ground called Dairy Ground. Quite bizarrely, nine whole years later, somebody realised that these fields had been labelled the wrong way round and so their names were switched in 2016. So if somebody recommends you to camp in Dairy Ground please remember they may well be referring to the much larger field next door. In the South Western corner of the site there are a number of relatively small camping fields. The next one we happen upon in our anti-clockwise journey around the site is a relatively new addition called Back House. When I did my tour around the site on the Thursday lunchtime in 2016 this field wasn't even open for people to camp in and the guys who owned the one tent which you can see pitched there must have snuck in past the metal barriers at the entrance to the field. However I did notice later in the day that it was starting to fill with tents and so it seems that the field is held in reserve as a sort of overspill camping area for later arrivals. The field in the picture above is Bailey's, which is another relatively small and secluded field in the South Western portion of the site. It's very accessible from Gate D but is tucked away behind some high hedgerows and so doesn't tend to fill up anywhere near as quickly as the neighbouring and much larger Paines Ground. Rig's Field was only brought inside the fence and designated as a public camping space for the first time in 2014, when it was known as "Chambers". Prior to that it actually formed part of the West 60 campervan field and the designated gate to the Western campervan fields still enters into the site via this field so despite it's remoteness you do get foot traffic through here pretty much 24 hours a day, including yours truly stumbling back to my van at 4am each morning. Next door is South Park 1. Like its neighbours, this field is surrounded by both the perimeter fence and high hedgerows and therefore has a secluded feeling to it. It is however a good 10 minute walk from here to the Park and much further to any of the other major entertainment areas. For the first time in 2017 South Park 1 became home to a new area called Cineramageddon which would have added more to the noise and foot traffic in this area than had previously been the case. Have a look at "What Else Is There To See And Do?" in Part 6 for a better idea of what goes on here. South Park 2 is the most southerly of the public camping areas and as you can see it has some pretty spectacular and unobstructed views looking north towards the Pyramid and Other Stages and across most of the festival site. It's on a bit of a slope but only the part closest to the fence appears to be uncomfortably so. This is the absolutely vast Paines Ground which is probably the biggest single camping field on the site now. It slopes gently and is where my son and daughter and a lot of our friends have all decided to camp since moving here for the first time in 2014. Paines Ground used to have space for new arrivals on the Thursday but with the adjacent Park Home Ground becoming increasingly popular and reduced in size with the arrival of Arcadia, the overspill has meant that Paines Ground is getting close to capacity on the Wednesday afternoon these days. Please see my previous comments regarding the labeling of Dairy Ground and Paines Ground and how they swapped names in 2016. If your friends tell you that they always camp in Dairy Ground they may well actually be referring to this field. The amount of public camping available in Park Home Ground was reduced by more than a third in 2014 with Arcadia moving into its new home in the flatter middle section of the field. This also created a fair amount of additional through traffic and noise into the early hours so please don't expect a peaceful night's sleep here until at least 3am when Arcadia shuts down for the night. See the "What Happens At Night?" section in Part 6 for a better idea of what I am talking about. Like it's neighbours, Park Home Ground slopes gently and it also has the advantage of being right next to The Park entertainment area, which occupies a tree-lined portion at the top of the field. It's also just a short hop over the disused railway track to the Other Stage Field. At the top of Park Home Ground you will find "Camp Arcadia" which is affiliated to Arcadia but is nevertheless open for public camping. Here the organisers try to foster a community spirit by building communal areas with seating, fire pits and artwork and also ensuring that the area remains litter-free. If you are interested in helping them build this environment they can arrange for ticketholders to gain access to the site on the Tuesday, a day earlier than the general public, and to stay on for an extra day at the end to help with the pack down. One of the most popular camping fields is Pennard Hill Ground, which we can see here looking uphill from the disused railway with the tipi field and the lounging area further up the slope behind it. This is where I camped, or at least pitched a tent, with a group of friends for four of the five Glastonburys between 2008 and 2013. ”Pennards” has the reputation of being a bit of a party zone as it's the closest public camping area to both the Stone Circle and the late night "Naughty Corner" in the South Eastern portion of the site. It fills up very quickly and there is usually very little space left here by the Wednesday lunchtime. Unfortunately the bottom of "Pennards" is the camping area which suffered worst from flooding following the massive thunderstorm which struck on the Friday morning in 2005. As you can see from this photo, which was taken by my friend Bob Rose for The Guardian newspaper, the deluge flowed down the hill until its escape into the River Whitelake, which runs through the site, was blocked by the railway embankment at the bottom of the hill. Major drainage improvement has since been undertaken to alleviate the problem should we be unfortunate enough to see a repeat of such extreme rainfall and in recent years the area at the bottom of the field has been cordoned off for crew camping. Access to all of the camping areas to the South West is reasonably handy for those using the Western Car Parks and entering via Gate D but it's a long hike from all of the other gates. If you are still not certain where you want to head for when you arrive at the site then ask the stewards who should have up to date information as to which areas have already reached their maximum capacity. 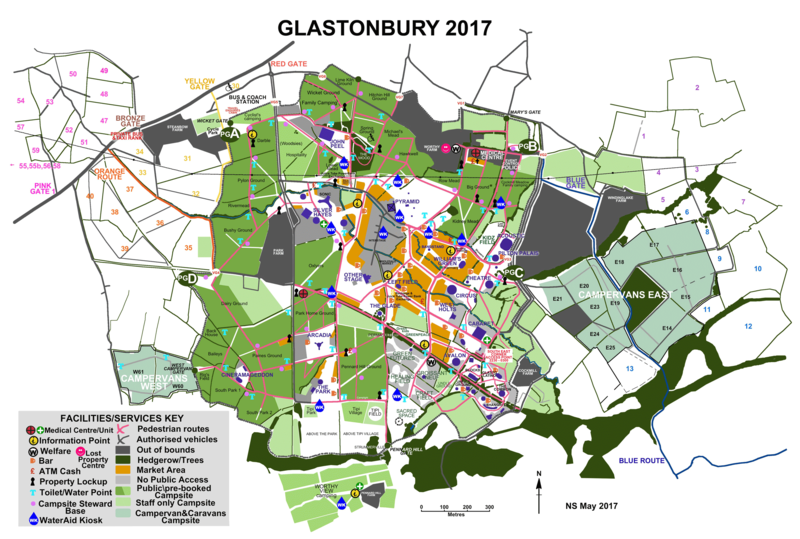 There are usually large maps of the site at each of the pedestrian gates and at the camping steward bases, with the fields which are designated as already being full shaded out. The last fields to fill up are generally to the West of the site. I took the photo above at 11:06am on the Thursday of the 2017 festival and what this helpful chap is showing us is that at that point in time the most popular fields like Pennard Hill, Park Home, Paines and all the fields surrounding the Pyramid were either completely full or getting very close to it. However most of the fields to the West of the site were still being shown as between 60% and 80% occupied or even less in some instances as some of the photos above, which were taken at a similar time, will testify. So basically if you are not turning up until later on Thursday or on the Friday and are arriving from the East, be prepared for a very long walk and travel lightly because you will also be struggling through the throngs of people who have got there before you and are already partying hard and enjoying their festival. There's nothing more disheartening than watching the later arrivals having a melt-down as they struggle with huge piles of gear in the search of non-existent camping spots. If you tune your car radio in to Worthy FM as you approach the festival site you will find that they too will be giving out details of which fields still have plenty of space for you to camp. If you are told by a steward that a field is full don't try to sneak in anyway. The festival has been heavily criticised for overcrowding in the past and the resulting safety concerns have been an issue at the festival license hearings. So if you camp in a field which is already "full" you are effectively jeopardising the future of the festival. On several occasions I’ve also seen people pitching tents in areas which are designated as fire lanes. Please don’t do this or you’ll only find that you are asked to move your tent to somewhere where it isn’t blocking an emergency access. If you are hoping to camp with friends who are going to be arriving later than you then it is preferable to take their tents with you and put them up for them rather than try to save space. Many people frown on the practice of taping off areas and I have to admit that I feel that it is rather anti-social and goes against the tremendous community spirit which otherwise prevails at the Festival. If you must tape off an area for friends who are arriving later, head for one of the less popular camping fields where space isn't going to be at such a premium. It would be polite to put up signs around your patch saying something along the lines of "Space saved for friends arriving Thursday, Thankyou". Your neighbours are less likely to think you're just being greedy. Also make sure that the tape you use is highly visible to prevent tripping and don't tie it to your tent so that if somebody does trip over it they won't take your tent down with them. Before you leave home make sure you have at least one dummy run at putting your tent up and try to familiarise yourself with the process so that you can erect your tent without needing to read the instructions. Don't forget that when you get to the festival you may have to put your tent up in a limited amount of space and possibly windy or rainy weather. It could also be dark. Even if you've used your tent before it's still a good idea to put it up before you leave home to make sure that it hasn't perished and none of the parts have gone missing. Check all the poles to see if any of them are starting to fray or split. Much better to replace them now than trying to hold them together with tape at the festival. Try to pitch your tent away from toilets and pathways if you want to avoid unpleasant smells and having your tent trampled into the ground. The temporary tracking is great for getting around but is also incredibly noisy if you camp nearby and the sound of boots clomping along throughout the night will drive you insane. The same applies to the slamming metal doors at the longdrop toilets. Remember that dips and gullies can potentially turn into ponds and streams in the event that it rains heavily and if you’ve pitched your tent in one of these areas then no amount of waterproofing will prevent your tent from being flooded. If at all possible pitch your tent with the door facing downhill and/or away from the prevailing wind. This will prevent a pool forming in your porch if it rains or the wind gets up. It's also much more comfortable to sleep with your head pointing slightly uphill. If the weather is sunny then most tents become unbearably hot by 8am. If you want to have a bit of a lie in every morning then try to pitch your tent to the West of trees, hedgerows or other large tents and structures so that your tent is shaded from early morning sunlight. Alternatively some tents are made from reflective material and tend to stay cooler for longer. Others have openings at both ends in order to create a through-draft. Covering your tent with foil or pitching it under a gazebo, parachute or camouflage netting are other ways of keeping your tent cool and shaded. Not all guy ropes are essential in anything other than stormy conditions and the more you have pegged out the more likely people are to trip over them and damage your tent. And please don’t tie guy ropes together or block the paths which naturally form through the campsites with other obstacles. People have to get in and out of the campsite somehow and blocking their access and exit is not only anti-social it is also dangerous in the event of an emergency. If you want to minimise the number of people walking past your tent then simply pitch it away from the main pathways and as close to your neighbour’s tent as possible. Remember that once you have put your tent up and gone for a stroll the landscape may have changed significantly by the time you return, especially if you've included a visit to the Cider Bus or Brothers Bar during your wanderings. So before leaving your tent, make sure that there is a visible landmark nearby to use for navigating your way back again. Many people make their own flagpoles but try to think of something a little more original than the ubiquitous Cross of St George. Yes, special tickets are available for groups of people who want to share the ethnic experience of living in a tipi for the duration of the festival. These cost £1,075 in 2019, which sounds a lot but the tipis comfortably accommodate 6 people, so you are effectively paying a little under £36 a night each for your accommodation for 5 nights. The hired tipis are in an area known as the Tipi Village, which is situated on the hillside overlooking The Park area at the Southern end of the site. Facilities here include showers and toilets which are specifically for the use of tipi residents. Tickets for the Tipi Village usually go on sale in late October at the same time as those for the Campervan Fields and Worthy View. In recent years crime at Glastonbury has fallen to an all time low and this is predominantly down to the "Ring Of Steel" Super Fence. Admittedly, before the fence was introduced in 2002, as many as 100,000 "fence jumpers" would get into the festival without paying, and unfortunately a good number of these people came with the sole intention of helping themselves to everybody else's belongings while they were away from their tents. In 2000 I lost count of the number of times I returned to my tent to find it had been ransacked and there were many instances reported of tents being slashed or even being completely removed together with their contents. However the introduction of the Super Fence and much better security both around the site, in the car parks and also in the neighbouring villages, all but eradicated one of the issues which seriously threatened the very existence of the festival. Muggings at the festival, for example, fell from 157 in 2000 to a statistic which is very rarely reported nowadays. Don't take anything that you can't afford, or wouldn't want, to lose. Don't leave anything visible in your car and open the glove box to show it is empty. Don't leave anything valuable or attractive to thieves in your tent. Don't padlock your tent. This is an advertisement to any thief that there is nobody home and there is something worth pinching inside. A padlock is no protection against a knife and then you've got your tent ruined into the bargain as well. Don't keep all your money in one place. Use several wallets so that if you do lose one it won't completely ruin your Festival. Do use the Property Lock Ups. Do get to know your neighbours, look out for one another and report anything suspicious to the police or campsite stewards. Do take all of your gear out of your bags as soon as you set up camp. Thieves are opportunist and if they can't grab a bag and run within a couple of seconds they generally won't bother. If you are leaving cans of drink in your tent then take them out of their packaging and spread them around. Do keep your valuables in your sleeping bag at night. Many people have woken to find their tent open and their trousers missing together with their wallet, camera, phone, car keys etc. Do kick up a fuss if somebody comes into your tent during the night. If you don’t then you’ll probably find that your friends and neighbours are the next people to be paid a visit. The peak time for tent thefts is in the early hours of Thursday and Friday when wallets are full and punters often overindulge, celebrating their first nights at the festival, so please try to be particularly vigilant at these times. There are at least a dozen Property Lock Ups dotted around the site which can be located by looking for the keyhole symbols on the Site Map. They are basically large steel cages housed inside marquees. They are free to use although a donation towards the charities and peace organisations who run them would be appreciated if you can afford one. They operate a cloakroom style ticket retrieval system but will also ask for details of your name and address in case you manage to lose your ticket and so that they can verify that you are the genuine owner of the stuff you leave when you come back to collect it. It's a good idea to take a photo of your ticket as a back up precaution as well. The picture above gives you a good idea of what the Lock Ups look like. You can store anything in there from a camera to a bicycle. The lock ups are open 24 hours a day but they close at midday on the Monday so make sure you have collected anything you have left there by then. Getting lost at Glastonbury is all part of the fun and in all honesty there are some parts of the site where I still have to look at a map and think twice about which way I need to go in order to get to my desired destination. If you do end up going slightly wrong then the chances are you'll stumble across something random and unexpected so it's never really a massive deal. If you really do get seriously lost then there are signposts at all of the major junctions of the tracks which criss-cross the site and you have the simplified map in the mini-guide you hang around your neck to put you back on track. If you still have no idea where you are then ask one of the stewards in the pink hi-viz jackets or just find your way to the nearest Information Point where they have far more detailed maps available for your convenience and the staff will be able to show you exactly where you are and give you directions on how to get to wherever it is you want to be. There are a few landmarks such as the Pyramid Stage, the Acoustic Tent, the pylons, the illuminated Ribbon Tower in The Park (see above) and the Tony Benn Tower at the main Meeting Point near Williams Green, which are visible from around the site and can be used as navigation beacons. Remember that the Pyramid and Other Stages face away from one another and share the same backstage compound, so to find your way from one to the other is simply a matter of following the tracks around in a large circle. As far as the rest of the site is concerned there are 3 major thoroughfares which are handy for getting quickly from one part of the site to another. The disused railway track crosses the festival from east to west, so as long as you can find your way there then places like Pedestrian Gate D, the Other Stage, The Glade, the Green Fields, West Holts, Avalon and the late night areas around Shangri-La are very easy to find. Similarly there is another track which runs perpendicular to the railway from the Sacred Space and the Green Fields in the south, past West Holts and the Circus Field to the central market area, Williams Green and the main Meeting Point. It then continues as "Muddy Lane" up past the Kidz Field and through the Cockmill Meadow Family Camping area to Worthy Farm and Pedestrian Gate B at the northern end of the site. A third track, known as Stage Road runs from Vehicle Gate 5 in the northwest, past the Silver Hayes Dance Area to the Pyramid/Other Stage backstage area. It re-emerges from the other side of the Pyramid Field and continues past the Cider Bus, the Kidz, Acoustic and Theatre Fields and on to Pedestrian Gate C in the East.